Successfully Added Nanum II Car Air Humidifier - 180 Degree Humidification, Adjustable Bracket, 2 USB Ports, Aroma Diffuser, Plug And Play (Black) to your Shopping Cart. The quality of the air we breathe is becoming an increasingly important issue as the exposure to harmful particles can have a severe negative effect to your health. Especially when driving your car in over populated cities or on busy highways you are unnecessarily exposed to a high amount of bad quality air that may have a negative effect on your health. Luckily the Nanum II car air humidifier offers a simple and affordable solution to turn your car into a place where you can enjoy fresh and clean air at any time of the day. Being an air humidifier and aroma diffuser in one, the Nanum II car humidifier cleanses the air within your vehicle while, additionally, spreading a pleasant aroma. By increasing the humidity in your car this portable air humidifier reduces allergic symptoms, flu, and dry skin. 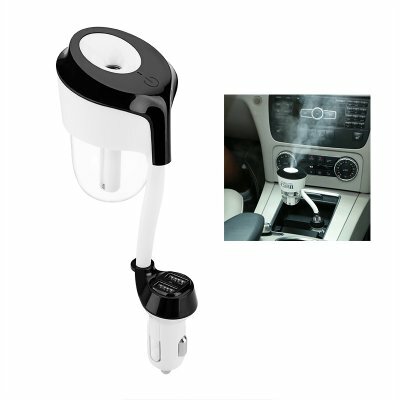 Simultaneously the possibility to add essential oils to this miniature car air humidifier allows you to spread a pleasant and fresh aroma throughout the car – increasing your mood and reducing your anxiety and stress. With the Nanum II Car Air Humidifier you will breathe fresh and clean air all the way along. Holding two USB ports this compact car humidifier offers the possibility to charge multiple mobile devices. From now on you can be ensured that, no matter where your next road trip will bring you, your smartphone will never run out of juice. No matter the climate, this Narum II Car air humidifier will significantly help you to increase the quality of the air in your car. Reducing allergic reactions, illnesses, and dry skin – this portable air humidifier is a stunning car accessory fit for any vehicle out there. Enjoy a pleasant aroma while staying healthy, the Nanum II car humidifier you lets you enjoy your upcoming holidays and road trips to the most. The Nanum II Car air humidifier comes with a 12 months warranty, brought to you by the leader in electronic devices as well as wholesale air purifiers..
Arabic: - سيارة الهواء المرطب - Chinese Simplified: - 汽车空气加湿器 - Czech: - Zvlhčovač vzduchu auto - Dutch: - Auto Air luchtbevochtiger - French: - Humidificateur d’Air de voiture - German: - Auto-Luftbefeuchter - Hebrew: - הרכב האוויר מכשיר אדים - Hindi: - कार एयर Humidifier - Hungarian: - Autó levegő párásító - Italian: - Umidificatore d'aria auto - Japanese: - 車の空気加湿器 - Korean: - 자동차 공기 가습기 - Malay: - Humidifier udara kereta - Norwegian Bokmål: - Bilen luften luftfukter - Romanian: - Umidificator de aer auto - Russian: - Увлажнитель воздуха автомобиля - Spanish: - Humidificador de aire coche - Thai: - เพิ่มความชื้นอากาศรถ - Turkish: - Araba hava nemlendirici - Vietnamese: - Xe máy độ ẩm.